We fly into Kugluktuk, on our way to the territory’s western region of Kitikmeot, and realize we never tire of the glorious Arctic overview. 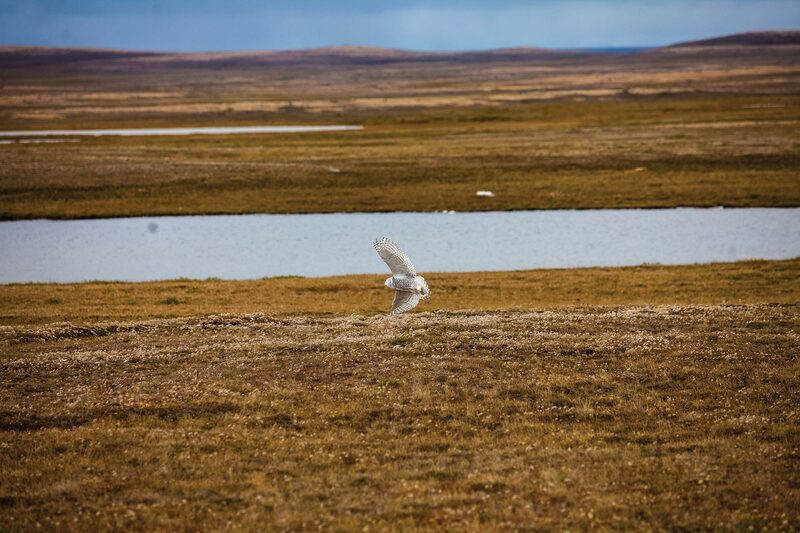 Descending into the hamlet, we cross over the Coppermine River, which cuts across a topography void of trees and looks like a ribbon unravelling across the open tundra. After a stop at the Enokhok Inn, we mount up on our now official mode of transport—the ATV—to explore the region with Koda Adventure Tours. Kugluktuk sits at the mouth of the Coppermine River at Coronation Gulf on the Arctic Ocean. Our guide Grayson leads us out of town along muddy trails to Kugluk Territorial Park, and as usual we feel the thrill of chasing an endless horizon. 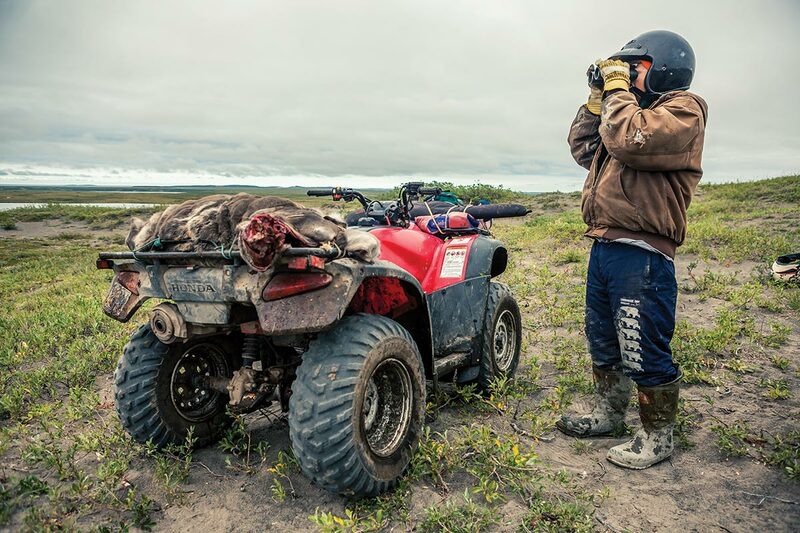 We are passed by a group of teenagers who are buzzing around looking for bears that had been spotted in the area, and meet a man with a caribou strapped to the back of his quad, returning from what was clearly a successful hunt. At the park we stop to watch the river cascade through Bloody Falls. 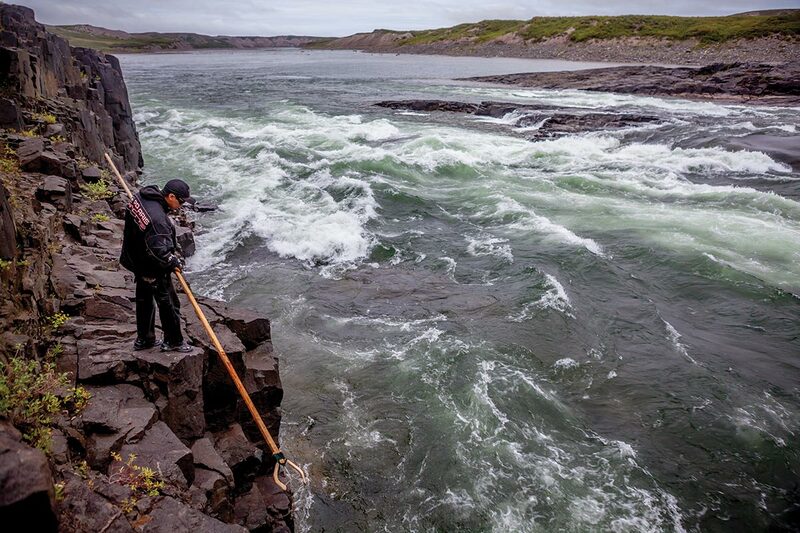 People are busy picking wild berries while others line the banks fishing by rod and reel, traditional kakivak harpoon, and even trying their hand with bow and arrow. 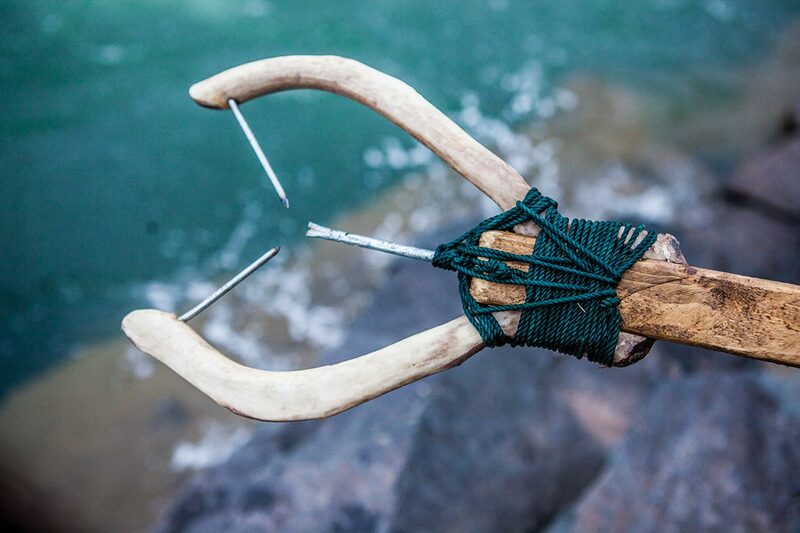 The kakivak, a traditional Inuit harpoon. We are about to move on when we suddenly notice an oil leak from one of the ATVs. A satellite call is made to Koda tour operators Grant and Christabelle, who set off by boat upriver to collect one of us—the rest, we decide, will continue our exploration on the remaining quad-bikes. Later, on the way home, we stop to visit Christabelle’s Uncle Allen. 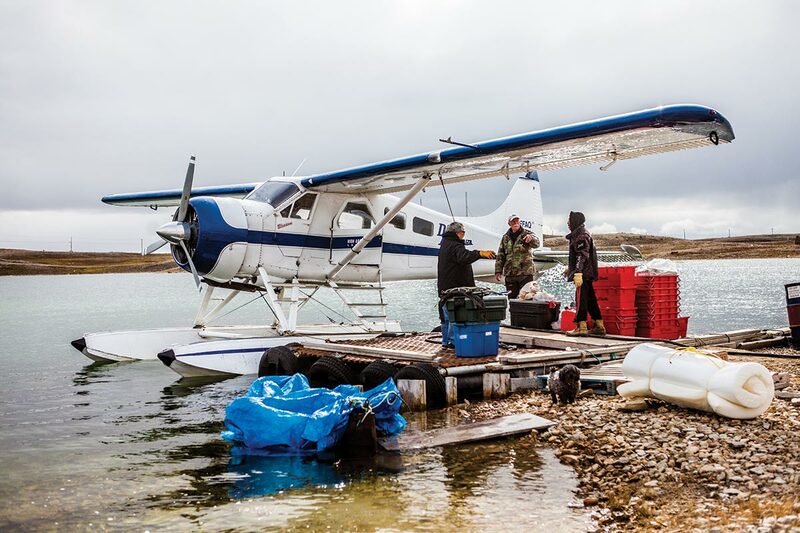 A conservation officer, Allen Niptanatiak lives a traditional Inuit life—he is out on the land whenever possible—and right on the river in a cabin with his wife, Grace. We receive an incredibly warm welcome and are served fresh homemade bannock: the famed deep-fried fritter bread of the North. Everyone has his or her own style of making bannock—a staple up here—and Grace’s version is absolutely second to none. We fear we may never leave. After a night of heavy rain, we set off the next day to explore the Coppermine River on Grant and Christabelle’s boat, which is uniquely capable of navigating shallow water and ideal for the river’s ebbs and flows. Gerry and Rebecca Torretti of the Kitikmeot region are guiding us today, taking us out on foot to explore what we’d only seen briefly the day before. Grant comes along with shotgun in hand on the chance we stumble across a polar bear in a low-lying bush. The terrain is rolling tundra and rocky outcrop, and Gerry, an experienced hunter of renown, surveys the land with a keen eye and displays an unmatched outdoorsmanship. “That would make a great shelter,” he says casually, as we trek by an innocuous-looking rock outcropping. We stop for lunch at Grant’s cabin, perched above the Coppermine River, and absolutely gorge ourselves on caribou soup and more delicious bannock. It is fantastic! Then it’s back in the boat to race along the river before revisiting Uncle Allen, who by now is buried under a mound of grandchildren. Actually, he’s just returned from the river and is weighed down with Arctic char and white fish. The fishing is always good up here, we’re told. The hospitality is so warm, the food so fresh and tasty, that by evening’s end we feel we have known these people forever, that somehow we belong. Back in Kugluktuk, it’s the first day of school, and as we stroll around town school board employee Christabelle is on the lookout for pupils who are not where they’re supposed to be. (Team Outpost is suddenly glad we’re on her good side!) Though the town has a population of just 1,400, a large percentage are under the age of 18. Throughout our entire polar peregrinations, Team Outpost has flirted with fog, and each time we’ve shown it who we were—we out-waited it in Pang and Pond Inlet, even cautiously boated through it on the Hudson Strait. Until now, when we’re trying to fly to Cambridge Bay, and no amount of fog-defiance is going to let that happen. And when things like this do happen up here, the North forces you to recall life lessons you know but may have forgotten—that circumstances are often beyond control, that patience is a virtue that to adapt and overcome divine. Eventually we make it to Cambridge Bay on Victoria Island, though with so much thick cloud floating over the runway (which feels almost heavenly) we might have to double-back to bannock central. As it turns out, we don’t—and instead are met at the airport and taken to Green Row Executive Suites by manager Dan. “You’re in the suite the prime minister had during his visit here last year,” Dan tells us as he hands us our key. Once the door is closed we fight over who is going to be the PM and who’s going to be his chief of staff, until we are called to order by Vicki of Qaigguit Tours and taken for a look around town. We first go to the Arctic Coast Visitor Centre to learn about the region, where across the street we see the old Hudson’s Bay Company buildings, and across the bay lie the remnants of explorer Roald Amundsen’s ship, the Maud, which is poking above the surface just off shore. We visit, too, the remains of rudimentary shelters used by the Thule so many centuries ago before Vicki takes us to see some remarkable Inukshuks. Vicki is a font of knowledge, and while adventure has been largely on our Arctic docket, the history we’ve absorbed about our country’s and this territory’s early origins has been most compelling. “My husband, Jorgan, and I would like to invite you to our cabin at Mount Pelly,” Vicki later says, continuing the hospitality we’ve experienced across the North. We heartily accept, and as we drive toward her cabin that afternoon Vicki tells us to be on the lookout for muskoxen. Our eagle eyes have already spied whale and seal, orca and narwhal, even a polar bear. We are confident we can spot a five-foot shaggy, bearded muskox! “There’s one!” we almost shout, child-like, pointing at a brown cluster to the right of our track. Glimpsing a snowy owl take flight. Just shy of the cabin, Team Outpost restores its reputation by spying a small herd of genuine muskoxen, huddled not too far from the track. Quietly we dismount our vehicle, and with cameras ready begin to stalk them. Despite our finest tracking skills, the muskoxen scatter and are soon mere specks on the horizon. Before visiting Vicki’s cabin, we decide to tackle the 200-metre Mount Pelly in Ovayok Territorial Park. Though no Everest, its slopes soon wear out the gaggle of children who had spontaneously joined our expedition, and before long Team Outpost is once again alone in the roaring silence of Nunavut. At the summit, we read a small plaque dedicated to the Inuit soldiers who served in the Princess Patricia’s Canadian Light Infantry Regiment, and gaze out over a breathtaking vista of tundra, rock and small bodies of water settled beneath a moody, sun-streaked sky. We head back down to the cabin for a bite, some great conversation and even a little golf, as Vicki and Jorgan have a makeshift driving range in front of their cabin. Jorgan is a Canadian Ranger, part of the area’s search and rescue team, and the manager of Mineral Agreements for Nunavut Tunngavik Incorporated. He’s also a keen hunter and fisherman, and invites Team Outpost out on the water before we head back to Cambridge Bay. During the drive back, Jorgan spots more muskoxen and pulls over—now we’re hopping, we think—and though this time we get a little closer once again they scatter. As we walk back to the vehicle, we pass an Inukshuk standing like a sentinel of the land, silhouetted against the kind of sunset only seen in these northern latitudes: a dark sky blending into brilliant orange and reds, and filtered through layers of cloud. We have heard it said that one can leave the North but the North cannot leave you—by now we understand it. Boarding the plane to Kitikmeot. Back in Cambridge Bay, Team Outpost settles into our final night in Nunavut. We are shocked by how quickly our travels have passed—from grand Baffin Island and Pond Inlet, to Repulse Bay and Rankin Inlet, to the Coppermine River and now Cambridge Bay, to all the communities in between—but energized and invigorated, almost aghast, by all we’ve seen and experienced: the ocean and tundra and mountains and rivers, the trekking and camping in national parks, the cruising for wildlife, the raw Arctic fish and bannock, the warmth of our northern hosts. Wherever we travelled in Nunavut we were met by those who adore the North: whether locally born Nunavummiut or transplanted émigré, all proclaim their love of a land with relentless horizons and an incomparable sense of freedom. As we take our last look at the midnight sun, it’s hard to argue with that. This article originally appeared as part of our opXpeditions Nunavut feature in Outpost Magazine’s 2013 Global Travel Guide.